THE OPERATIONS DIVISION OVERSEES fire suppression, emergency medical services and technical rescue response for the communities served by East Pierce Fire and Rescue. 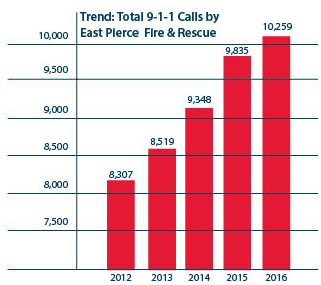 East Pierce Fire and Rescue is a combination department utilizing both career and volunteer firefighters to handle a wide variety of emergencies. Career firefighters and paramedics are automatically dispatched to calls throughout the 153 square miles that is protected by the district. If unstaffed volunteer stations are located closer to an incident, they will also be dispatched to the scene. While on duty, the firefighters participate in training, public education events, vehicle and equipment maintenance and other routine activities. 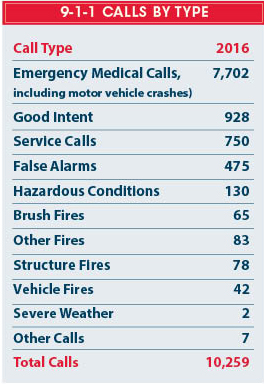 A regional 9-1-1 center, called South Sound 911, dispatches the appropriate fire and EMS units from the fire stations closest to the emergency call. More than a dozen fire districts, including East Pierce Fire and Rescue, financially support Fire-Comm through an inter-local agreement. The Fire District’s headquarters fire station, Station 111, is located in Bonney Lake at 18421 Veterans Memorial Drive and houses emergency response personnel in addition to the administrative offices for the District. This Division is split into three shifts, each headed by a Battalion Chief, who is assigned to the headquarters station.